So i collected out money again, and after two or three months' break I'm again giving away a lovely perfume! I don;t know If I should start it today or on 1st June, but i was too excited to let you guys know about it. 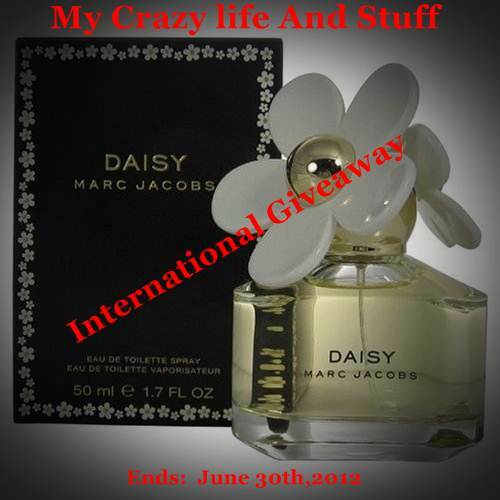 So i couldn't help setting up a raffle-copter widget and then here i am posting about it too..
Marc Jacobs Daisy Eau de Toilette Spray 1.7 FL. OZ. thank you for being such awesome followers! wait, let me put more ads on it! maybe then you can see.. aren't you the one who tweeted me too about this ad problem? in what way you can't? if you go on the main page there you'll see ads under the first post! i have the same issues too ,fatema. I love cosmetics and accessories!! I think more Harry Potter stuff!! I think perfumes are great! Or maybe some cute jewelry? I love reading and following your blog and the giveaway! Keep it up! Next giveaway can be cosmetics or akin care products. Thanks. A Makeup giveaway would be great! makeup! it can be either MAC, NARS or Sephora. totally random but have you seen the Sephora Pret-a-porter collection? they're gorgeous!! But it seems that everyone's crazy over naked and urban decay nowadays, no? how about urban decay naked, nida? i hope you'll love that! Your giveaways are terrific and I can not think of anything else. I hope that is still good for an entry because you are doing great at choosing your giveaways without any influence at all! Thanks so much! MAC products =D I love them! You may give away a clothing item. We will appreciate anything you want to give away! Thank you. I love cosmetics on giveaways. Thank you! I love cosmetics and accessories on giveaways! I love cosmetics on giveaways. Next giveaway? You find some different and interesting things and I love that, you should decide. Your like button on rafflecopter is not working it says error and when I click on that it says full of spam? make up :) or cirlce lens. maybe nail polish, i love it. Visa Gift card will be very useful, thank you. Perfume is always a welcome giveaway. Some sweet-scented body cosmetics... like balms, oils, etc. Amazon gift certificates. I am unable to follow you via GFC so I follow via Bloglovin (I didn't take credit for it, just saying). Check out my blog if you're interested in entering some giveaways. I love perfumes...maybe another? Or some make-up? Thanks for the giveaway! MAKE-UP, I love Make-up more than anything! I love perfume and fancy soaps so hope you will give away those in future. Hope I win this one. I'd love to see a makeup palette for the next giveaway. Next time I would love to see cosmetics. I'd be happy if you gave away Chanel's Mat Lumiere Foundation or Vera Wang's Flower Princess or Bouquet perfumes. For me this is the perfect giveaway:) But I would love to see Chanel nail polish for the next giveaway. definitely would like to try it! some drugstore makeup can be great too I think. I want ELF, can't get it here in my country.. Instead of saying something specific I already want, I would rather see you giveaway something that you use and really like! That way I might discover something new! Unique and rare kinds of accessories. Thanks for creating such an amazing giveaway. Clutch :) will be great..
Any cosmetics that are hard to find or expensive in the US! I think you should giveaway gift certificates to etsy shops! I would love cosmetics products!! cosmetics for youy next giveaway :) I like you're blog I often read it. Nail Polishes are my favorite. Urban Decay Naked Palette 1 or 2. Urban Decay Naked Palette 1 and 2. Maybe some makeup/skincare items? Thanks!